You’re so vain. At least that’s what the camera makers have decided. All that smartphone selfie action has now resulted every camera maker trying to come up with their 180° LCD swivel so that they, too, can get you selfie-ized. The Panasonic GF7 doesn’t make a lot of sense to me. In essence, it’s a selfie-ized and totally consumer oriented GM1 at the point where Panasonic has a very good GM5. Sure, there are some hardware and software driven improvements—240Hz focus information, lower light focus response, plus better noise handling and shadow recover in JPEGs—but does those things really push the camera beyond it’s vainglorious focus? Moreover, the lack of enthusiast-desired controls pretty much tells you what you need to know: this camera’s aimed at the true, vain, consumer. If I have a smartphone, I already have a selfie capable camera that’s quite competent, and about to get much more competent with the next generation of models. Moreover, I don’t need to fiddle with “easier WiFi connections” to show my face to the world. Sure, with the GF7 I’d have a pretty capable m4/3 ILC camera I’m carrying around with me, but frankly, I just don’t see myself pulling it out to perform a selfie; I’ll do that with my iPhone should I ever get vain, thank you. And if I want a carry-everywhere m4/3 camera, I’d rather have the also small GM5, which is more enthusiast-oriented. This is the thing that keeps tripping up the camera makers: they’re well behind in enabling the types of photography that the younger generations are performing, such as selfie posting to Facebook. One reason they’re behind is that the camera makers not only don’t control the mobile software marketplace, but they’re distant participants, at best case. The WiFi-to-an-App solution is more convoluted workflow from a product that already has convoluted workflow, and the young recognize that immediately. Thus, the target audience for this camera probably won’t exactly embrace it. 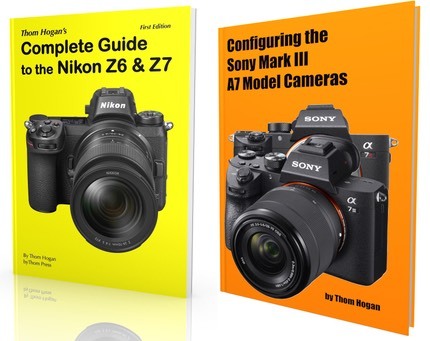 The exact goal—and it’s a moving target and subject to change—for a camera maker is this: convince the millennials and younger that they need a better camera and that in so choosing one, they don’t complicate the workflow their image goes through. All the things you do on a smartphone have to be done on the camera for that goal to be achieved, even if the actual transmission of the data eventually goes through the smartphone itself. Just adding pink as a color isn’t going to attract as many users as making the integration better would ;~). Of course, that’s where the problem of not controlling the mobile software market hits hard: Apple and Google are iterating their operating systems annually, while Internet services are doing it even faster, both adding and changing abilities faster than any camera maker could ever take advantage of them. About the one exception to this has been Samsung, who has managed to get their NX cameras—including their selfie camera, the NX Mini—better integrated with their smartphones. But then again, Samsung is one of the leaders in smartphones and has some influence on how the smartphone market evolves. There’s nothing particularly wrong with the GF7 as a consumer camera. It is, after all, just the latest iteration in one of the longest surviving lines of mirrorless cameras. So yes, it does some things a bit better or faster than the previous model. The problem is that the previous model wasn’t exactly a best seller. The low end of mirrorless is starting to get cannibalized by smartphones, too. Panasonic themselves realized that when they introduced the GM line, the latest of which—GM5—is as close to a pocket DLSR as we’ve come. I’m not convinced that the GF7 and GM5 don’t essentially split sales rather than grow sales. A few other bits and pieces: the built-in flash is weaker, the flash sync speed is now 1/50, the hot shoe is gone, the battery is rated considerably lower than its predecessor (230 shots CIPA), the LCD no longer tilts downward, WiFi connects via scanning a QR code on the LCD (no NFC), the maximum frame rate increased, and the body is slightly thinner despite the flip LCD. Cost of the camera with kit zoom lens is US$600. But here’s Panasonic’s thinking: the GF7 is a women’s camera, the GM5 is a man’s camera (apparently men don’t take selfies). Note that black isn’t one of the colors for the camera. 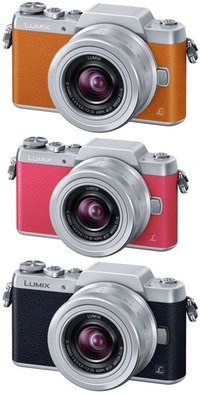 The colors chosen by Panasonic are all “accessory friendly” for women.